Victories on the battlefield and fresh martyrs underline al-Qaida in the Arabian Peninsula's [AQAP] territorial gains, according to the latest issue of its English-language Inspire magazine. Its cover story is called "Sadness, Contentment, and Aspiration." "They obliterated the apostate army, took millions of dollars from them, and were able to obtain enormous heaps of ghanimah [booty]," AQAP said about its soldiers. The magazine also states that the group has seized "everything from tanks, hummers, anti-aircraft weaponry, armored vehicles, and all sorts of heavy and light weapons." A picture later in the magazine, showing al-Qaida forces taking possession of an armored vehicle, seems to confirm at least a small part of the group's claim. 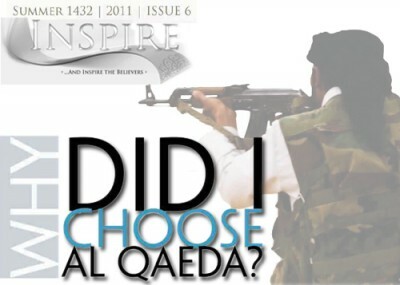 The latest issue of Inspire is packed with updates on military advances, new threats, and commentary on the direction of the al-Qaida's global jihad. It also contains an apology by Editor Yahya Ibrahim, for the late release of the magazine. But, as Ibrahim asserted, the content of the magazine and the business of AQAP make up for the wait. "The battles in the southern parts of Yemen have led to the complete routing of the army forces and the clearing of the land from the filth of the corrupt Yemeni government," Ibrahim wrote. "But there is a price for everything. During these great battles we have lost some of our dear brothers; brothers from the first generation, the ones who were with us from day one. You will read about some of these martyrs in this issue." Al-Qaida also alleges that local citizens helped the group to seize territory in a coastal province. "The masses in Abyan have come to the aid of the mujahidin and together, they took on the capital of Zinjibar," the group claimed in its "New Flash" section, which also features excerpts from articles by the Middle East Media Research Institute (MEMRI) and the Investigative Project on Terrorism. For AQAP, such action is proof that popular revolutions will lead not to democracy, but to governments ruled by the group's strict interpretation of shariah law. "It is true that the protesters want jobs, better living conditions, justice in all spheres of life and the likes, as any normal person living under tyrannical rule would yearn for such. The analysts' misapprehension is in what the shariah offers and what the people want," senior leader Anwar al-Awlaki wrote in response to an emailed question. "The call of the protesters for democracy are in actuality calls for basic rights and freedoms, that the shari'ah provides; it doesn't have much to do with democracy per say. Now that they have eliminated the ruling tyrannical parties, the obstacles have become less for the pavement to the path of shari'ah. All in all, our shared interests are much greater and momentous than America's supposed claims that the protests help them." Awlaki also appears elsewhere in the magazine, in full battle gear. The "New Flash" section addresses American drone strikes against the American-born leader, claiming that "the fact that the drones were unable to pinpoint his location or follow him … is a sign from Allah that He protests His believing slaves." Awlaki supposedly even mocked the attempts, saying "It looks as if someone was a bit angry with us this evening." Despite the group's supposed popular acclaim and strong advances, the magazine does deal with significant losses to AQAP and al-Qaida at large. It lionizes several fighters killed by enemy soldiers or by drone attacks. For example, one obituary describes the bravery of Abu Ali al-Harithi, who moved from Iraq to Yemen to carry out "operations" there. "In Abyan," his obituary said, "his vehicle was struck by a missile from an American drone. Nothing remained from him except small pieces of flesh scattered around." The magazine addresses Osama bin Laden's death with both lamentations on the "loss of a great leader" and congratulations for his achieving the goal of martyrdom. But it pledges that his death will have little effect on the future of the organization. "The news brought us a mixed sentiment of sadness, contentment and aspiration," wrote American jihadist Samir Khan, in the magazine's cover article. "Sadness because we lost one of the greatest Islamic revolutionaries - if not, the greatest revolutionary - in modern times. Contentment because we knew that he achieved what Prophet Muhammad always yearned for: shahada'[martyrdom]. Aspiration because we remembered our Prophet's guarantee that jihad will resume till Judgment Day." His death is also just one in a chain of leaders al-Qaida has lost, Khan wrote. "Living in the States never made me think twice about the path I was undertaking, although many of the mujahidin leaders were killed such as Abu Layth al-Libi, Abu Khabbab al-Masri, Mullah Dadullah, Abu Mus'ab az-Zarqawi and others. For me and all of those who follow the path correctly, jihad is not for the sake of these commanders and leaders; rather it's for the sake of Allah." The issue highlights AQAP's losses, while simultaneously providing information about the group's operations and American drone strikes. Senior leader Abu Ali al-Harithi was killed by an American drone strike, while sniper and artillery specialist Fawaz al-Ma'ribi was killed in an operation against a Yemeni checkpoint. Each additional article focuses on different personalities and their courage in battle, typical of martyr biographies that are popular among aspiring jihadists. Notably, the magazine doesn't describe al-Qaida fighting pitched battles against Yemen's armed forces. Rather, the group is carrying out hit-and-run operations on military bases and suicide attacks on small groups of soldiers. Aside from the inspirational and theological materials, which make up the majority of the text, the magazine issues new threats. "We ask our brothers there to punish the Indonesian Government with swift terror for giving in to international pressure," the magazine said in a passing reference to the conviction of militant leader Abu Bakr Bashir. A full-page "Come to Jihad" advertisement features a combat knife, and encourages, "It's ready. Just needs your first step." "A Special Thanks to Tehrik-e-Taliban Pakistan – for Taking Revenge on Behalf of Shaykh Usama bin Laden," said another full-page advertisement. Did you say Al Queda is actually quoting MEMRI? Did they have the "womens' articles" they promised? Let us hope the rest of the leaders follow the example they encourage (without other damage, of course). What's all the fuss about 'Inspire'? I find people get a bit hysterical about 'Inspire' - probably simply because its AQ's web-published e-mag. Its very glossy and well put together from a graphic design viewpoint but its content is pure Islamofascist propaganda that appeals mainly to Muslim moonbats that like that sort of thing, wanna-be mujahideen and weak-minded dhimmis. Its full of stridently religious blowhard rhetoric and gross exaggerations. Given the ocean of garbage on the 'Net, only stands out because it looks prettier than most of the other garbage. Not a reason for many authorities in the West such as the Australian Attorney General to try and ban or restrict access to it. That only serves to peak people's interest in what is otherwise a very boring publication.